I got my $1.55 breakfast downtown but with bacon it was $3.16. Then it was up to talk to the lockmaster to get advice on whether to stay or press on as far as we can go. His advice was to stay as Waterford is the best place. At noon I checked the Erie Canal info line and they reported that the canal would be opened all the way to Buffalo at 1:00PM. We decided we might as well go on to the Schenectady Yacht Club just past Lock 7 which was our original plan. So now we are right back on schedule. You have to buy a pass to use the locks. At $37.50 for a ten day pass the lockmaster at Lock 7 cleaned us out of all our cash. 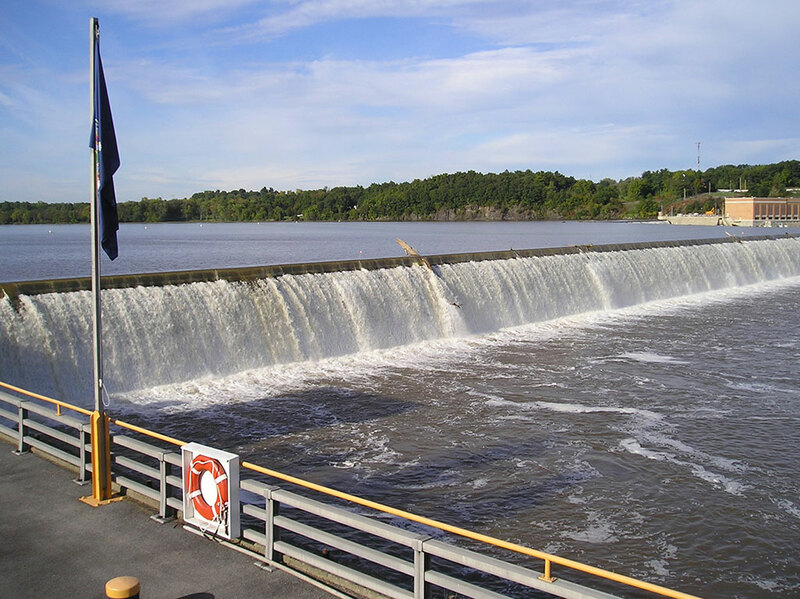 As you can see in the photo the water from Ivan was really roaring over the dam at Lock 7. Mavis wanted Chinese food delivered to the boat for dinner. I was able to convince the restaurant to take a check so we were able to get a great dinner with no cash. Tomorrow we will go 22 miles to Amsterdam. If we like what we see we will stay there, otherwise we will press on and maybe get ahead of schedule.